Like us, you may have noticed a different looking tattoo popping up everywhere. It is all through social media and you may have even seen someone with one and wondered what it meant. The semicolon might bring back days of sitting in school listening to the teacher explain how it can be used to join two ideas into one sentence instead of using a full stop. However, this tattoo has a powerful meaning for those who have it inked on their skin. The trend was started by Amy Bleuel in honour of her father who lost his life to suicide. So for Amy and those with the tattoo it says that they are the writers, the sentence is their life and they have found the strength to go on. Ink on skin to represent personal strength in the face of internal struggle. “The idea behind the tattoo is to say that your story isn’t over yet. That you are the author of your story and you are choosing to continue,” Bleuel told ABC News. Project Semicolon was started by Amy to give support and hope for those that are struggling with depression, suicide, addiction and self-injury. While it is a Christian faith based organisation they do not exclude those who may follow another religion or follow no religion at all. A quick look at #Projectsemicolon will show you just how many thousands feel the same. The amazing people at Semicolon Project are not trained mental health professionals operating a helpline so if you are worried about yourself or someone you know there are other contacts listed below. Not everyone gets the tattoo and there are plenty of creative semicolons drawn on with a permanent marker pen. The power of showing these drawings is that they start important conversations. The Semicolon Project encourages a discussion around mental health, for both those suffering from mental illness and their family and friends. 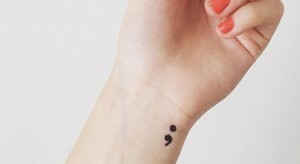 So perhaps when you notice someone with a semicolon tattoo you can ask them their story. Talking about mental health is something we all can do.